The 5th January 2019 it is the Chinese New Year, this year the animal sign is the pig. Chinese New Year, also known as Lunar New Year or Spring Festival, is the most important Chinese holiday. It is defined as the first day of the first month in the traditional Chinese calendar. The Chinese New Year events in London take place from the 7th and ending the 10th of February with the big Chinese New Year parade. What to do in London for the Chinese New Year? The Chinese New Year parade: The parade take place between Charing Cross before snaking its way through Shaftesbury Avenue in Chinatown. 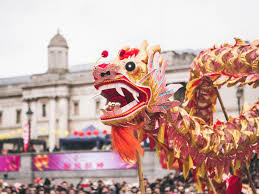 During the parade you will see lots of colourful floats and more than 50 teams take part in the vibrant Chinese New Year parade, which usually kicks off with dragon and lion dances and handcrafted floats. Chinese New Year Lion Dance at Asia House: Watching the Shaolin Fists Lion Dance Troupe perform as another powerful animal. Starting outside the main doors of Asia House, the Lion Dance will weave its way through the building to the sounds of drums, cymbals and a gong. Don’t miss it picking up five lucky oranges along the way. It will start at 11 am the 7th February at the Asian House (Free). 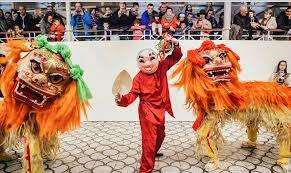 Chinese New Year at the V&A Museum of Childhood: Dance performances and music will fill the Museum of Childhood in celebration of Chinese New Year and the year of the pig. Take part in a calligraphy workshop, browse craft stalls and feast your eyes on lovely work in a Chinese children’s art exhibition. It will take place the 9th February at 11am at the V&A museum of Childhood (Free). 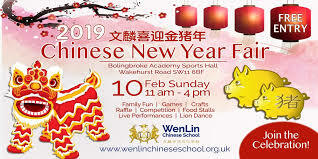 WenLin Chinese New Year Fair: Head to WeLin Chinese School who are putting on games, mini-competitions, craft sales, authentic Chinese food and live performances for the big occasion. It will take place the 10th February from 11am at the Ark Bolingbroke Academy (Free). Chinese New Year at ABC School: We will celebrate Chinese New Year at ABC School with colourful decorations prepared by our Chinese speaker receptionist Judy! Curious? Come to reception during the celebrations and find out your Chinese zodiac sign. ← We are glad to introduce you our amazing teacher: Colin!